Avior is a dinosaur/tortoise-like Bakugan which has wings and stands on two legs. He is owned by Mason Brown in Bakugan: Gundalian Invaders. Avior is part of Ren's team. It throws out flames, which can melt through rocks. Impact waves can blast out Avior's mouth. The abilities Long Airchulis and Battle Howling extends his body and changes his sphere mode mode. Although it is on Ren's team it is Mason Brown's partner. * Long Achilles: Transfers 400 Gs from the opponent to Avior. * Offering Armor: Nullifies the opponent's ability, and adds 300 Gs to Avior. * Volting Chain: Subtracts 300 Gs from the opponent. * Luft Howling: Nullifies the opponent's Gate Card. * Ifreet Cannon: Subtracts 300 Gs from the opponent. due to Mason calling him an old dog, And himself stating this. 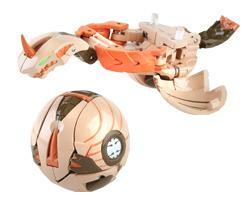 Purchase your Avior Bakugan from Amazon now!